A single message sent to 60 million people on Facebook … by University of California researchers may have encouraged 340,000 more votes in the 2010 election, a study suggests. The work … tracked the effects of the nonpartisan message from the point when it was first seen by individuals, through their personal network and into the voting booth. When the first recipients passed on the message, it included their pictures, a note that they had voted and a link allowing the next-in-line to find a nearby polling place [powered by the Voting Information Project]. The study was broken down into three groups. A second group, involving 600,000 people, received a similar notice that didn’t include pictures of their friends, and a third group of about the same size didn’t receive any post. The researchers then checked the publicly available voter rolls to see what effect their postings had on individual turnout. The announcement featuring friends’ photos were linked to 60,000 votes, and the follow-through messages were tied to another 280,000, the study found. There was no statistical difference in turnout between those who got no message and those who got the purely informational message. Close friends mattered most for the effect, the research suggested. The average Facebook user has 150 friends, and about 10 of those — the ones the user interacts with the most — accounted for the difference in voting, Fowler said. The effects were equal among self-described liberals and conservatives. This story has gotten huge media play – not surprising since it combines two popular topics, Facebook and the 2012 election – but aside from the topline result about turnout, I think the study is also incredibly valuable for the lessons it suggests about how best to reach voters. In my work with election professionals across the country, the issue of voting information comes up time and again; not just who and what is on the ballot, but basic information about times and places for voting – plus requirements like voter ID which voter need to know before heading out the polls. The challenge, of course, is that traditional methods of voter outreach like printed voter guides are costly and not as effective as they used to be in a world that is increasingly digital and mobile. This study – with its attendant observation about aiming messages at networks instead of individuals – could become another powerful tool in the election administrator’s voter outreach arsenal. Obviously, voter outreach can’t go completely digital or social – contrary to what you may have heard, not everyone is on Facebook – but this study suggests that election officials ignore social media (and its power to multiply messages across networks) at their peril. Previous: Absentee Ballot Numbers: Is It Just a Calendar Thing? 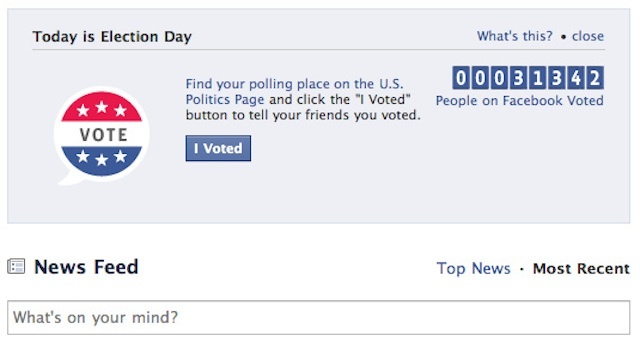 Be the first to comment on "Facebook Turnout Experiment Signals New Avenue for Voter Outreach"